Selamat berpuasa kepada all my followers, page viewers, passers by, friends and you reading this entry. If ever my words have ever wounded your feelings, I, with humble, pleading for your apologize. Let`s fulfill this barakah month with amalan2 mulia. Jangan disia2kan kedatangannya. 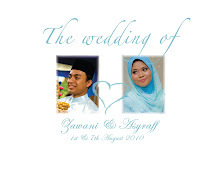 Last year was my first Ramadhan as a wife to somebody and we spent everyday of it by each other`s side. Alhamdulillah..It was indeed a wonderful journey. However this year, my fate is turned to a total opposite. I will be spending Ramadhan alone. So far this one is the toughest one I have ever been. I was a little touched by this situation. But I believe, Allah has better plan for me. Insha Allah..this time will also a promise to a great journey. Called my mom this evening...I am happy to listen to her happy voice and noises came from the kitchen. My whole siblings are by her side. Mom is always serious about welcoming Ramadhan and Syawal. She got used to it from my dad. Now dad has gone, I am so worried she`ll sad and cried alone. Nasib baik all my siblings are there tadi cooking special dishes with her :) I am so lega now. Salam Ramadhan 1432H, dari Nihon.